The jade plant, or money plant (Crassula ovata), is probably the most widely grown succulent houseplant in the world. It is popular because it is very easy to grow and because it is said to bring good fortune and money. Jade plants do make excellent houseplants, but can also grow up to 10 feet high if planted outdoors and can even be pruned into an exotic hedge. Jade plants have few problems in cultivation, but yellowing leaves are often an early sign that something is wrong. As succulents, jade plants only need to be watered when the soil in their pot has dried out completely. If you keep your jade plant on a windowsill, watering it once every 2 weeks should be enough. Do not keep the pot standing in a saucer that catches excess water as this will waterlog the soil and quickly rot a jade plant's roots, killing the whole plant. If the leaves on your jade plant are plump but turning yellow, reduce the amount and frequency of water. If you repot a jade plant, transfer it to a pot that is only slightly larger, as excess soil will act like a sponge and retain water around the roots. A completely neglected and underwatered jade plant will eventually lose leaves in a bid to reduce the amount of water it transpires. An underwatered jade plant will have wrinkled, leathery leaves that are not shiny, while a healthy plant has glossy, smooth leaves. A thorough watering will soon rehydrate the plant and promote new leaf growth. Succulent plants need very little fertilizer; too much can burn a jade plant's roots and cause the leaves to turn yellow and drop. Use standard houseplant fertilizer at one quarter strength once a month or use a specialized succulent fertilizer. While jade plants will tolerate a lot of neglect, a potted plant will eventually be unable to get any more nutrition from its soil and will start to suffer. If all the leaves on your jade plant are very pale green or yellow, it might need to be fertilized with a special succulent fertilizer enriched with micronutrients or with bonemeal. Jade plants that are not pruned will shed old leaves every year before their dormant winter phase. These leaves, generally large, older ones at the base of the stems, will first turn yellow and then drop off. This is a natural process and not a sign that there is a problem with your plant. 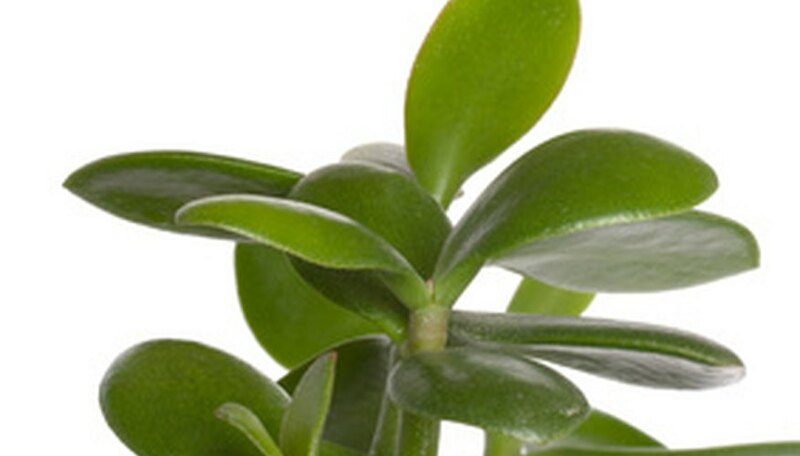 Do not use leaf shine products on your jade plant as they block up the pores on the leaves and suffocate the plant, causing the leaves to yellow and die. If you have recently moved your jade plant to a new spot, check to make sure it is not exposed to cold drafts and that it is receiving plenty of light.